We rented movies, and hosted the neighbor's dog. Ate what was in the house, and visited some friends as they moved into their new home in the neighborhood. HFRM#1 came over for leftovers and we didn't get in the car once. While Big napped, we settled into a DVD I got for Seven, hoping she'd enjoy the old 1961 film, The Parent Trap. Being somewhat of a pop-culture imbecile, I didn't realize that I had picked up the 1998 version of the old film, this one starring Lindsay Lohan. It was actually quite good, being an ultra innocent story (as compared to much of the television we ban Seven from watching) and being that it was the pre-rehab days for Ms. Lohan. Dennis Quaid as Nick Parker: Why do you keep saying ‘Dad’ at the end of your sentences? 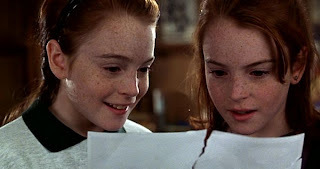 Lindsay Lohan as Annie James: I'm sorry. I didn't realize I was doing it, Dad. . . Sorry, Dad. . . . Do you wanna know why I keep saying 'Dad'? The truth? Nick Parker: Because you missed your old man so much, right? Annie James: Exactly. It's because, in my whole life. . . I mean, you know, for the past eight weeks, I was never able to say the word 'Dad'. . . Never. . . Not once. . . . And if you ask me, I mean, a Dad is an irreplaceable person in a girl's life. Think about it. There's a whole day devoted to celebrating fathers. Just imagine someone's life without a father. . . Never buying a father's day card. Never sitting on their father's lap. Never being able to say 'Hi Dad!' or 'What's up Dad?' or 'Catcha later, Dad'. . . . I mean, a baby's first words are usually 'Dada', aren't they? Nick Parker: Let me see if I get this, you missed being able to call me dad? Annie James: Yeah. I really have, Dad. This whole scene lasted only a few seconds, but it felt like a half-an hour. I kept thinking: Okay! We got the point! Move on! I kept watching Seven to see if she would exhibit any outward sign of a reaction to the scene. And the line Just imagine someone's life without a father. . . ran through my head like Marsha, holding her nose and hearing her mom say 'Don't play ball in the house!' in that Brady Bunch episode. So far she seems unaffected. I suppose it's like everything else in the world to her. How, for example, most stories, kids movies, etc. etc. don't really represent her life or her reality. I wonder if kids of GLBT parents are like GLBT people themselves in that they learn, somehow, to compartmentalize these experiences. To make them seem normal, somehow, to NOT feel like Lindsay Lohan's character was questioning her (Seven's) life also. Not just the character who, until that point, had not known a father, but Seven who does not know a father either. Whereas we GLBT people may look back and realize that we had been, for example, imagining ourselves in the opposite gender's lead (see Lesbian Dad's post on The Sound of Music when she says "What? Doesn't everyone?") or other similar techniques to put our round bodies into the square holes that society had formed for us, I wonder if Seven will adopt similar tools to feel more comfortable or less at odds with the world around her. Or maybe it was just a movie. I would have been frozen! Have you had any conversations with her about this since? We actually haven't talked about it. . . Although she constantly talks about the movie. She loved it and would watch it 24-7 if allowed.